How much moisture do red wiggler composting worms need? Worm composting is a form of composting in which you feed your vegetable food scraps to a specific type of earthworm, red wigglers. In nature, red wiggler worms live above the soil in damp rotting leaves or wood. In order to survive, red wiggler composting worms must have a certain amount of moisture in their environment. This article will teach you the correct moisture level for a worm bin and how to adjust the moisture level in your bin. Why Do Red Wiggler Composting Worms need a Moist Environment? All worms breathe through their skin. A worm’s skin must be moist to be able to breathe. If a worm’s skin dries out, it will die. You may have seen this when an earthworm gets stuck trying to cross a sidewalk in the summer. They end up dried up, shriveled, and dead. What is the Correct Moisture Level of Worm Bin? Worm composting bins should never be dry and should never have standing water in them. Ideally, the worm bedding should be at about 80% moisture. The bedding should definitely feel moist but when you squeeze it, no water should drip out. Also, when you squeeze it you should not hear crackling of dry paper or dry leaves. When your worm bin bedding is at the correct moisture level it should remind you of laundry right when you take it from the washing machine. The clothes are thoroughly saturated with water but not dripping at all. You added too much water when you first made your worm bin. Your worm bin got too wet over time by adding high water content food scraps (80%-90% of most veggie food scraps is water). Add a couple handfuls of fresh dry bedding. Shredded paper works really well for this but any type of worm bin bedding will work. Mix the dry bedding in and it will soak up the excess moisture. This will work for any type of worm bin and should be the first thing you try. If your bin does not have a drain in the bottom, you may need to turn it on its side to drain some of the excess water from the bottom. This needs to be done a couple times a year if you are using a storage tote style worm bin. 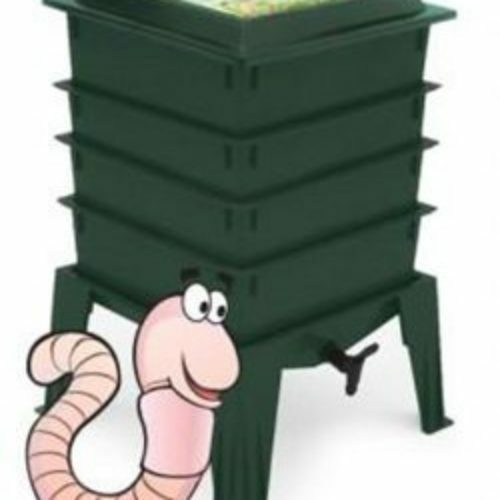 Simply tip your worm bin on its side so that the worm bin leachate can run out one of the air holes that you drilled. What is leachate and can I use it? Learn here. If your vermicomposting system is ever too dry you need to add some water. The easiest way to add moisture evenly to a worm bin is to use a spray bottle. Simply spray the dry areas of your bin until they are the correct moisture level of worm bin. You should not have to do this too often. One way to help regulate the moisture level in your worm bin is to place several sheets of soaked newspaper loosely over the bedding like a blanket. This will help retain the proper moisture level in your worm bin. As you care for your red wiggler composting worms and your vermicompost bin, the moisture level of the worm bedding will fluctuate over time. Use the above techniques to help maintain the correct level of moisture for a worm bin.